Most Residential Real Estate Transactions, involve 2 Agents! The Seller typically signs a Contract with an Agent, and agrees up front to pay a Commission. One Agent markets the home (the Seller’s Agent,) and then all the Agents in the entire area can show the home to their Clients. 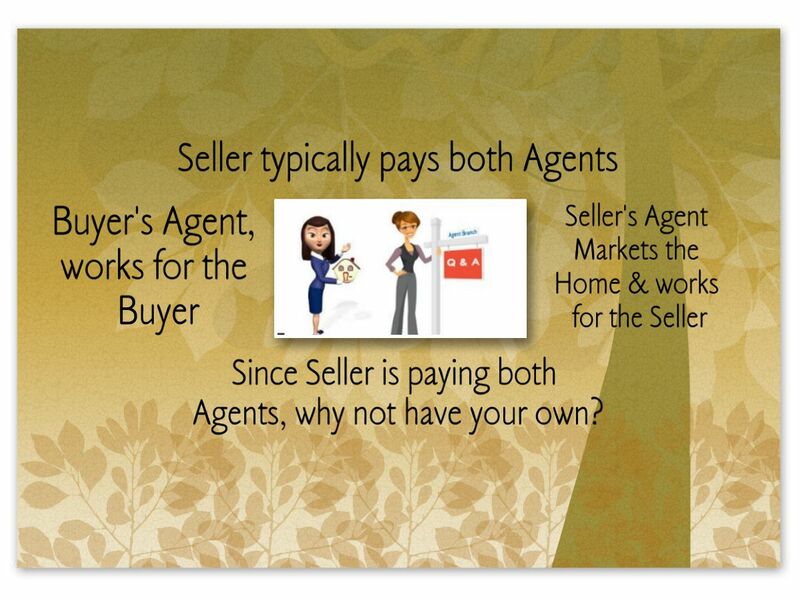 Agents & their Companies work together in harmony, and share information, to get your home sold! If you go through the “Seller’s Agent” to buy the house, that Agent then becomes a “Dual Agent,” and can no longer advise either party, but only relay neutral information. That Agent (Seller’s now Dual Agent) then gets the entire Commission. So you are getting less in regards to representation, and there is no one to advocate a better price for you. You need your own Agent, who can argue the best price for you, advise you, help locate possible issues the home may have, help discover issues that will prevent your loan from passing the home, and help you negotiate with the Seller’s Agent to complete necessary repairs. Since the Seller agreed to pay the “Buyer’s Agent” Commission at the time they placed the home on the market, why in the world would you not want a Buyer’s Agent? It would be like going to court, and denying free representation, to have no representation. As your Buyer’s Agent, the Seller pays my fee to represent you, and you are not obligated to pay me anything if you don’t buy. Having a Buyer’s Agent will enable you get the best price for the home, get the most repairs negotiated with the Seller, help you discover issues with the house you might not be able to live with later, help you avoid homes that might not Appraise for the price the Seller wants, help you find a home that has good potential resale value, help you determine what possible issues the Bank will have with the home, and help you avoid throwing money at a home that won’t pass the Loan Process. If you are thinking of Buying a home, I’ll help you with every step of the way, from getting PreApproved, to finding a house that will be a solid Investment for your Family & lifestyle! Give me a call today for your No Obligation Consultation! Looking to buy or sell? Call Donna Hughes with Keller Williams Realty today!